Renowned for their highly detailed sports figures, McFarlane Toys will join with 2K in a partnership that will benefit fans of the NBA, as well as, the wildly successful NBA 2K video game series. 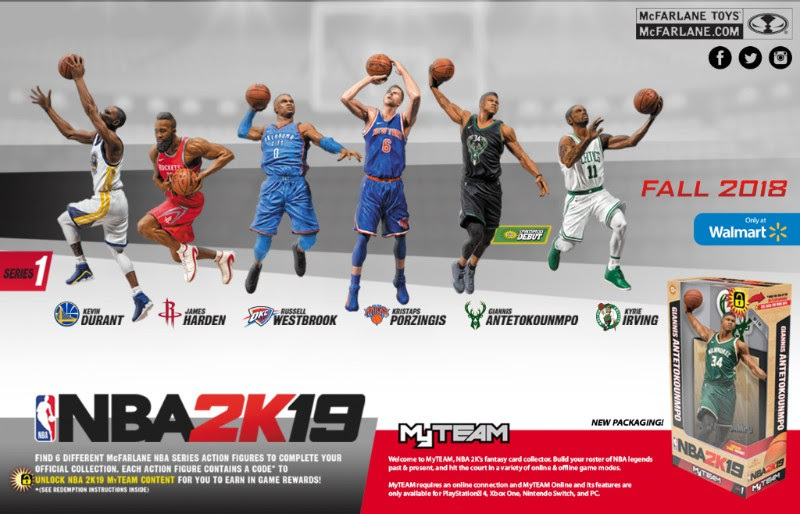 McFarlane Toys’ inaugural series of NBA 2K19 figures will come with a bonus digital Locker Code unlocking “MyTEAM” content that gamers can use in the extremely popular “MyTEAM” game mode in NBA 2K19. The NBA 2K franchise has been the standard bearer for basketball games for two decades and was the highest selling sports video game in 2017. The game’s “MyTEAM” mode allows gamers to customize their own team consisting of former and current NBA superstars. With the purchase of each McFarlane NBA 2K19 figure, fans will receive a Locker Code containing a “McFarlane Pack” which will unlock one Ruby Card, of one of the six players in the series. McFarlane Toys is renowned for creating highly detailed action figures and construction sets of brands from all across the entertainment spectrum for over two decades. Its upcoming collaboration with NBA 2K19 will continue that tradition showcasing figures of some of the most elaborate characters in video games today. Series one of the line will showcase: NBA 2K19 Cover Star Giannis Antetokounmpo of the Milwaukee Bucks, NBA MVP James Harden of the Houston Rockets, NBA Finals MVP Kevin Durant of the World Champion Golden State Warriors, Russell Westbrook of the Oklahoma City Thunder, Kristaps Porzingis of the New York Knicks, and Kyrie Irving of the Boston Celtics. “Joining with NBA 2K is exciting, that franchise has evolved into a juggernaut, not just with the NBA but with video games altogether, and to have our figures associated with it, just feels like a natural fit,” said Todd McFarlane, founder and CEO of McFarlane Toys. This August McFarlane Toys’ NBA 2K19 figures will be available exclusively at Walmart and will carry an MSRP: $24.96. For more information about NBA 2K19 visit www.nba2k.com. For more information about everything McFarlane Toys, fans are encouraged to check out www.mcfarlane.com as well as the McFarlane social media channels for updates and news.